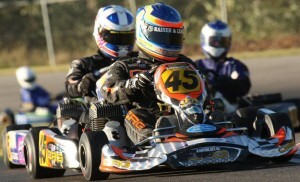 CRG walked away with a trifecta of victories after the running of the 2010 CIK Stars of Karting Series final round. The event was held at the Todd Road, Melbourne race circuit of the Go Kart Club of Victoria. Pierce Lehane convincingly won both the KF3 National and Victorian Championships even though he was faced with very stiff competition. In spite of this he showed great skill and maturity whilst racing the finals. By winning the Championship, Pierce has also won the right to represent Australia at the Monaco Kart Grand Prix. Jason Hryniuk meanwhile achieved another milestone in his illustrious racing career by winning the Yamaha Clubman East Coast Title. In winning the series, which was run in conjunction with the CIK Series, Jason has won the opportunity to represent Australia at the All Japan Championships to be held later this year.